My computer teacher is Mr. Kimbley. In his class we learn how to build a website, and all these things that are on my website. I really learned a lot in this class. This class is really fun, and interesting. I can't wait to see what we will be learning next. I have Mr. Kimbley for two periods on Tuesday. I like computers, because I learn something new everyday. This is a certificate that I won for completing My Digital Life. My Digital Life is a game that teaches you about online safety, and how to manage a blog or website. It is a really fun game, that teches you alot. It gives you a video to study and to listen to, and at the end, it gives you a quiz to see if you are really understanding what you are learning. It gives you a quiz at the beginning of the video to see how much you know about the topic and at the end to see how much you learned from the topic. It has seven videos to watch and take quizes on. At the end of all the seven videos, it unlocks a special game with all the seven topics you have been studing on. When I took the game at the end of all of the videos, I scored 605 out of 600 points. The game says that you can score higher that 600, but I guess that 600 is the average for all the games, so that means I still pasted. I learned how to tell if a website is credible or not, how to manage my website, online safety, how to stop the cycle of bulling, and how to take care of bulling. I think all of these things are very helpful through out our lifes. I am glad that I learned all of these things, because at first I didn't know how to figure out most of these things. This game really helped me to figure out moist of these things. The conection I made with this was Brainpop. Brain Pop is a website that has all kinds of videos, of what ever you want to reasearch about. it helps you understand things from gramar to blogging. I made this connection because I remember Brain Pop have a video about blogging, email, and other simular things like this. Brain Pop also has quizez at the end of every video. It is just like My Digital Life. Brain Pop also ha games to help you understand the concept more. Brain Pop helps you alot and it helped me understand what I was doing in My Digital Life. It all made sense to me. This is a certificate for Power Searching with Google. PSWG, or Power Searching with Google, is a course that teaches you how to be a better searcher on Google. This is a courses where you have to watch videos, and take a practice activity at the end. After the first three courses, you have a mid-test. That test will prepare you for the last test at the end of all the six courses. The tests are pretty easy if you take notes on the video, like I do. Power Searching with Google, is very easy, and teaches you more than I bet you even know about searching. It took me about a month to finish this and get my certificate, because some of the videos you have to wait for, because Google is barely just releasing them. This is a typing practice game. Typing is pretty hard, if you are just barley learning it.This typing game made it fun and easy to learn. Although I did not do really well on this, I tried and I plan on doing better next time. To get to this site just type freetypinggame.net I took this test on January 14, so I am doing better in typing. The tools that I used for this game was my hands and a keyboard. You have to have fast hands to have a higher number for the words per minute. You also need a keyboard to help practice. This game also reminds me of Typing web.com typing web is just like this website. It as test that you can practice with as well. I really like this website and tyingweb.com because they help me type faster. This is a presentation on how to make sparklines and graphs in Microsoft Excel. We learned how to do this in my Computer Applications class. It is very simple to do so. If you don't know how to make sparklines and graphs, please look at my presentation. Maybe this might help. The tools that I used for this was Google Drive's Presentation. This type of program is located on the internet, so you do not need to download or pay for anything, because it is free. This website is also pretty straight forward, so you know how to use it instantly. I really recommend this program, because of its slick design. Have you ever used Google Drive? If you took the time to go through my slide, tell me if you learned from this. Please comment down below! As you can see, there is a presentation with the same topic as this Glogster Well, the problem with that is that you have to flip through every single slide, and that gets boring. This is were this Glogster comes in. This Glogster gives you a more visual feel. You can see everything at once. It beats flipping through every slide! In case if you are wondering, Glogster is a web site that allows you to make online posters. It is a very great website, because instead of killing trees for paper, you can use Glogster. Another great reason why Glogster is very great, is because you can embed the HTML into anything. I think you can also send it as a e-mail attachment. This Glogster is just basically teaching you about how to make sparklines and graphs in Microsoft Excel. If this dose not really make sense, just watch the presentation about it up above. The materials that we had to use for this Glogster was just your knowledge and the website Glogster. Tell me what you think, do you like the presentation or the Glogster better, comment down below! This is grade spreadsheet that we had to make in my computer class. 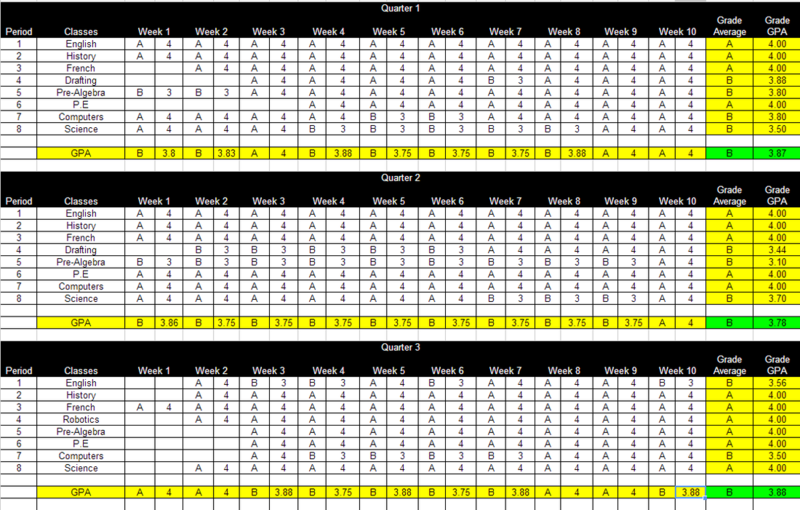 It keeps track of our grades and tells us how we did for the quarter. This project was pretty complex to do. We had to put formulas and make columns for the spreadsheet. A thing that made this easy was the picture guide that Mr. Kimbley put up on his website. We could compare our work with his to make sure that it is just the way it should be. One of the pictures is a spreadsheet from Google and from a Microsoft Excel. 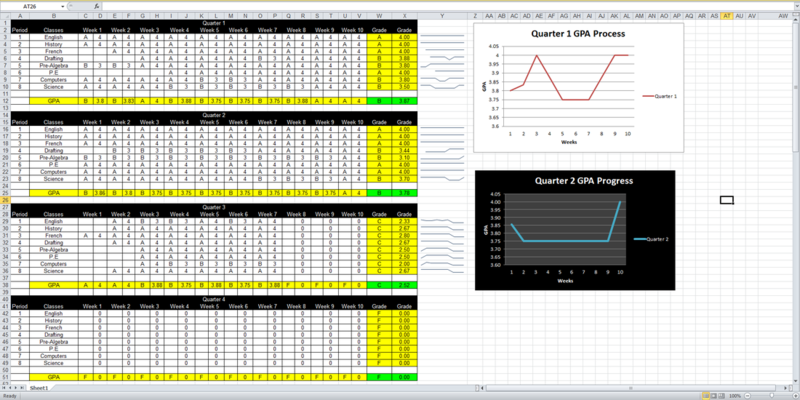 We used both programs, because for Microsoft Excel, we were able to make sparklines and graphs. Like I had said before, we used Microsoft Excel and Google spreadsheets. I like both programs, because they are both straight forward. It took me about a week to finish the Google spreadsheet, and it took me about one and a half weeks to make the Microsoft one, because we had to insert sparklines and graphs. If you are interested in making sparklines and graphs in Microsoft Excel, I have made a presentation and a Glogster to help teach that lesson. This spreadsheet really helped me track my grades, because it told me how my GPA was and how I was doing each week in my classes. This is a quiz that tests what you have learned from my presentation. There will be another quiz with the same questions, but the quiz will be a review. It will tell you the answer once you have submitted your answer In other words, you know right away when you get a question right or wrong. It=f you do not know anything about what the quiz is telling you, there is a Glogster and a presentation to help you. The tool that I used for this quiz was Google Forms. Google Forms allows you to make quizzes online. 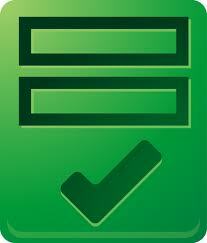 It is a very great way to make quizzes because it can correct the quizzes automatically. To correct the quizzes automatically you need to have Flubaroo. To make a Google Form, you need to have a Google account.